Styled with a delicate engraved design, these elegant creole earrings are crafted in classic 9ct gold for a polished finish. Wear with complementary yellow gold jewellery for a coordinated finish, or contrast with bright jewel tones for a contemporary finish. Elegant jewellery for every occasion. 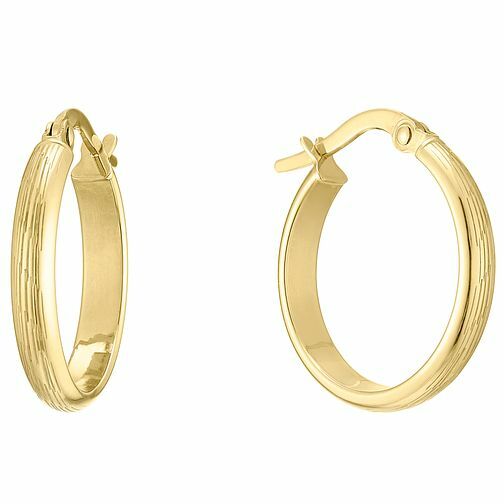 9ct Yellow Gold Engraved Round Creole Earrings is rated 3.0 out of 5 by 2. Rated 1 out of 5 by Anonymous from dont close properly and you will lose them I was given a pair of these as a gift and lost one within a few hours of wearing it. I blamed myself and bought a new pair (despite never having lost one of the other creole earrings sold on this site) and despite looking fine like the last pair, they fell out of my ears due to a poorly made closing clasp. I thought it was just one that wasn't working but now the other one comes unclasped too. Had I worn the second pair out I would have lost them too. These are very defective as at first they appear to close properly but check them in your ear and they have come undone and won't close properly. Obviously thats why I lost the first earring, and Ernest Jones refuses to take 'liability' as I dont have the other earring to prove it. The proof is in the lost earring and the two defective ones I have in my possession from an entirely new pair. Accepting liability is one thing but good customer service is another. When you pay at this price for earrings you should be able to trust that they won't be gone in hours.